nyphonejacks: Small office telephone closet wiring clean up. 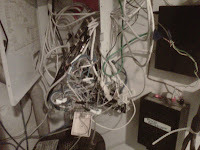 Here is a small clean up job of a rat's nest of telephone wiring that I recently completed. Here is the mess when I first got to the job. I had done a repair previously in this mess, that took longer than it should have because of this spaghetti. The customer wanted this cleaned up. While I did not take much effort to do anything with the data networking equipment, I still took some photos documenting the network shelf as well. Every thing complete. The round disk towards the bottom right side of the screen is a central vaccum system that is bolted to the wall, reducing the amount of space that I had to mount everything. I installed 2x 66 blocks to connect the 6 dial tones to the 15 or so jacks. As I said, I did not spend much time neatening up the data network equipment. 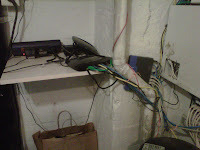 The whole purpose of my visit was to neaten up all of the telephone wiring. 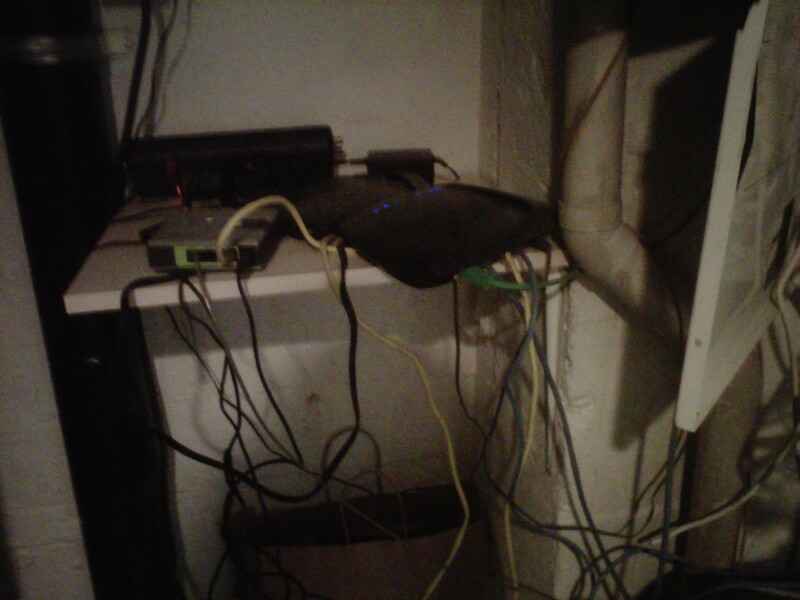 Now any technician that comes behind me will have no problem troubleshooting the telephone network. The person who has wired this apartment/office originally did run home runs to each jack. So each jack now is punched down on its own pair on a 66 block, and each jack can individually be disconnected by removing the bridging clips to that jack's pair, dramatically reducing the time it takes for any future inside wiring troubleshooting. Total time start to finish for this job was 3.5 hours.